If my bathroom over-share offends you, Dear Reader, consider this a public service. Because I’d like to warn you of one of the easier ways for homeowners to piss away money – by buying “sewer line insurance” that hardly relieves you of expensive repairs to your “poop pipe,” as a friend cheerfully calls it. I’m specifically talking about a “Water and Sewer Line Protection Program” I purchased from an insurance company affiliated with my water utility. 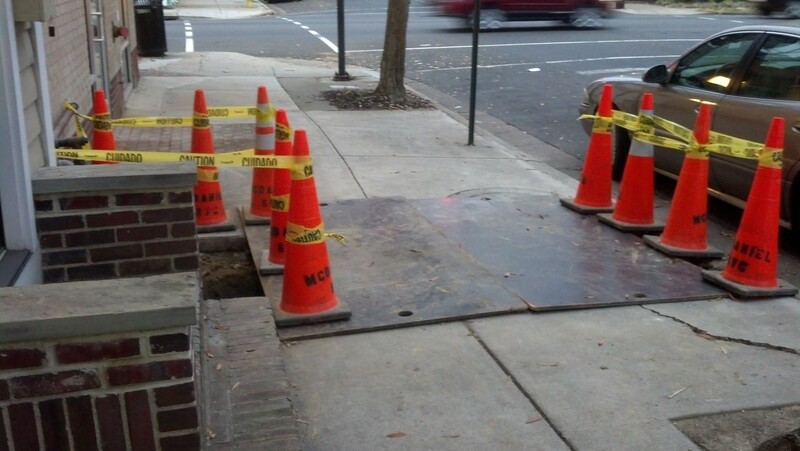 I bought the coverage (@ $12 per month) three and a half years ago, just weeks after moving to Old Town. 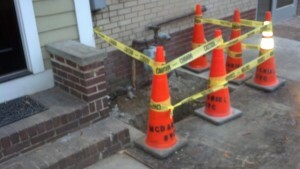 I’d received sewer line protection information in my water bill, and I’d heard that a charming 19th-century era neighborhood like mine comes with hundred-year-old clay sewer pipes that can get constipated and even break. Charming, not. Especially when you’re responsible for the entire sewer line running from underneath your house to where it meets the water main in the street. It’s a long way to go after you go. 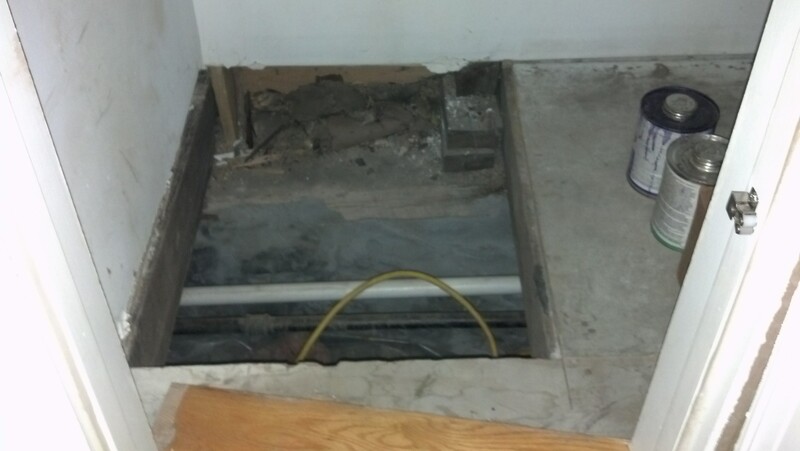 Here’s the 2×2′ crawl space under my stairwell, which plumbers had to squeeze into to dig and replace my sewer pipe. So I signed up for the policy. My welcome letter touted blanket assurances of “protection” by offering quick service “if a repair is ever required.” I could “rest easy” now. That turned out to be mostly hooey. On the Sunday evening before Thanksgiving, I walked downstairs to find my kitchen floor slick with soapy water that had overflowed from the nearby powder room toilet. The angel of mercy was with me, however, because I had just run my washing machine upstairs to clean bathroom rugs that weren’t very dirty so the backup didn’t even smell. Still, the effect on my hardwood floor was deadly. I quickly mopped up the water but it had sat for maybe an hour while I was upstairs. Within a day, the hardwood seams cupped and sprouted a few lines of black mold. Thankfully, my homeowners insurance policy will cover the cost of replacing my floor. First thing I did that night was call the sewer line insurance company to unclog my sewer, and my experience with them started smoothly enough. They sent plumbers to my house by the following morning who unclogged the pipe for a small service fee. 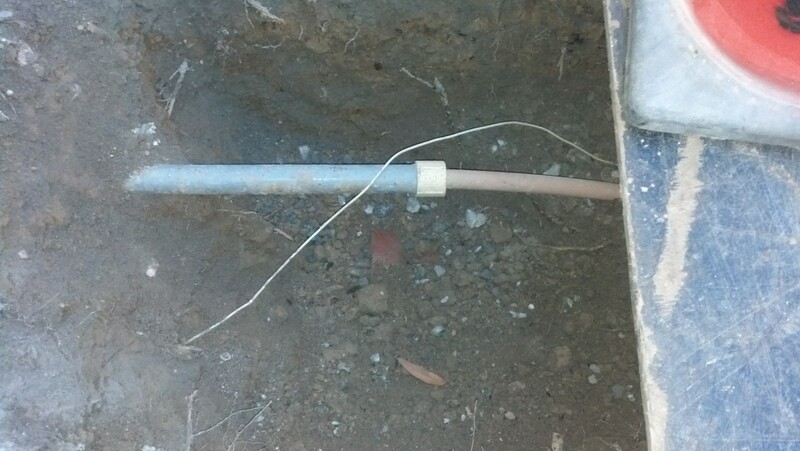 They “snaked” the pipe to clear it, then they pushed a video camera through the line to find the cause of the backup. Watching the camera monitor reminded me of the movie, Fantastic Voyage, but it was more like watching Katie Couric’s colonoscopy on the Today show. The camera didn’t travel far before we saw where an old section of clay pipe under my house had failed; it was broken open and askew creating the just-cleared blockage. In the camera’s bright light the pipe looked like the florid inside of a busted flower pot, not nearly as icky as Katie Couric’s colon. It had to be replaced right away, which is when I butted up against the true limits of my “crap insurance” as I like to call it now. That’s about 80% of my sewer pipe. The sh-tty news didn’t end there. The camera also showed that the clay pipe outside of my house, from my front wall to the curb, had tree roots growing inside at each of three joints. I thought, ok, it’s compromised clay pipe not under my house, the sewer insurance will pay to replace this part, right? Under my neighbor’s gas pipe you can catch a glimpse of my outside clay sewer pipe — yes, one’s right above the other! Nope. I was told that the insurance would cover only a procedure to trim the roots from inside the pipe with a cutting device. No pipe replacement. Problem was, my clean-out opening was too small for the cutting device to enter, so I’d have to install a new clean-out to cut the roots. The insurance wouldn’t cover that either. Hunh. 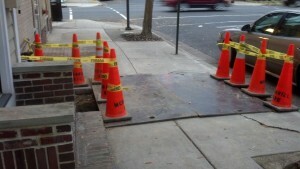 Not much choice but to replace that section of clay pipe as well, which meant tearing up the sidewalk outside my house. My out-of-pocket repair costs climbed into the thousands. In the next two days I complained to three separate insurance representatives in their claims department. Each poo-pooed my protests. I kept arguing the meaning of “repair,” a word splashed about my policy’s terms and conditions. “Too bad that phrase is nowhere in my policy,” I griped. 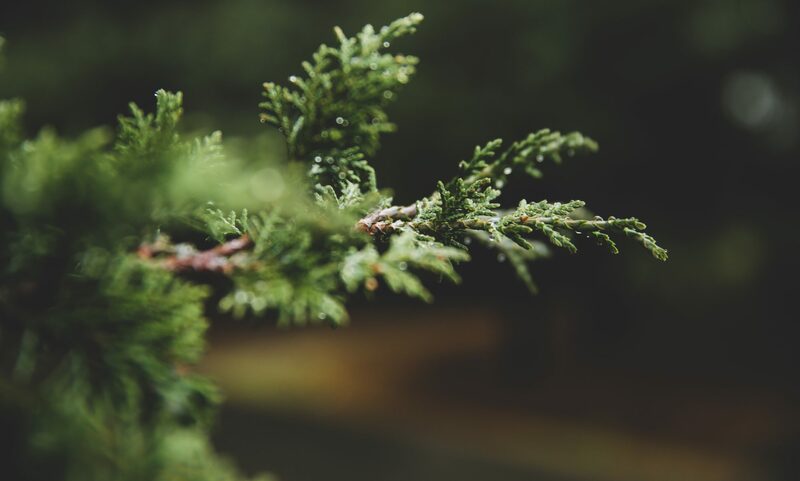 To sum up – this type of insurance pretty much covers only the cost of a plumber to unclog a failing sewer that’s already backed up into your house. Not much benefit for a so-called “Sewer Line Insurance Policy.” The amount of money I’ve paid into the policy is about what I would’ve paid the plumber directly to snake my pipe. If you buy a similarly named policy for your house, Dear Reader, take care to not step in it until you’ve read every word and asked lots of questions about what is and isn’t covered. You may find that what they’re selling you stinks.